Apple has lowered the boom on a Chinese iPhone developer, removing more than 1000 of its applications from the App Store after it was busted playing games with the rating system. The trouble began in late November when a reader of iPhoneography, a blog dedicated to iPhone photography and videography, noticed that reviews for apps created by Molinker looked a wee bit fishy. Despite the fact that most of its products were just copies of existing apps with a few added features, they boasted nearly-unanimous five-star ratings from App Store users, while a tiny number of dissenting reviews gave them only one or two-star ratings. Even dodgier, most of the reviews appeared to be written by the same people with the same poor grasp of English and who only reviewed Molinker apps. 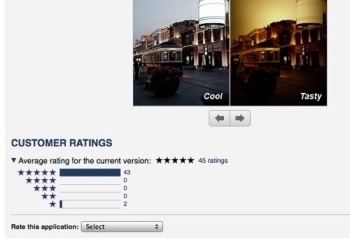 iPhoneography contacted Phil Schiller, head of marketing at Apple, with the information and suggested that Molinker was giving out "promotional codes" for its apps - essentially free copies - in exchange for the reviews. While there was apparently no proof of that, Apple was certainly convinced that the company was scamming the system: It quickly dumped Molinker's entire catalog of over 1000 apps from the App Store. Molinker's scam is a big deal because without a "try before you buy" system comparable to PC shareware, iPhone owners are dependent entirely upon their fellow users when it comes to figuring out where to put their money. Top-rated apps generally get more attention and more income, and Molinker's review scam was effective enough to land one of its programs, ColorMagic, on the "Staff Favorites" section of the store - which itself raises questions about just how legitimate these "Staff Favorite" lists are. As for the many people who bought Molinker apps based on the fake ratings, Wired notes that the company probably won't be inclined to offer any refunds; once some future OS update breaks the apps, they'll just be out of luck.